HIGH IN THE BRANCHES OF a tall, tall fir tree called FirHeart, a twelve-year-old nymph named Echo was getting ready for Nature School. This tree belonged to her and she belonged to it. She had lived in it since she’d been born, here in the forested mountains of Boeotia, Greece, and had even built a small, cute tree house in it for herself. Most of her tree’s branches grew horizontally outward from its main trunk, which had made it easy to lay boards to form the floor she stood on now. She’d also built herself a table and a shell-lined sink, and had fitted them into the tree’s natural curves. Instead of walls, there were handrails on three sides of her small house, with the fourth side left open as an entrance. The pulley-and-vine ladder system she’d made in science class helped her reach the tree house from the ground. Echo was busy deciding what to wear to class that morning, when a magic breeze carrying a bunch of scrolls whooshed by and tangled long tendrils of her green hair. Plunk! The breeze dropped an issue of Teen Scrollazine onto the sleeping hammock she’d woven back in fourth grade, causing the hammock to sway gently. “Thanks!” she called to the breeze. But it had already whooshed off to deliver scrolls to the two hundred or so other tree houses in this forest. She went over to the hammock, picked up the scrollazine, and unrolled it, planning to take a quick peek before school. Despite its name, the ’zine appealed to all ages, and it mostly carried articles about the immortals who lived on Mount Olympus. Since this forest was far from Olympus, Echo and her schoolmates never got the ’zine on time. This one was from two weeks ago. Still, everything in it would be new to her, and she would devour the entire thing later tonight. Stuff that happened on Mount Olympus always seemed way more exciting than whatever happened in the forest. In fact, things were kind of boring around here, or so it seemed to her. She glanced at the main article, which was titled “Grand Events Planned at the Immortal Marketplace.” It was about a big celebration that would be happening soon. Something involving a parade with floats, and then a wedding a couple of days later. Turned out that the parade was actually going to take place this very Saturday, and the wedding on Monday. Wouldn’t it be fun to go? she thought dreamily. But Mount Olympus was far away, and besides, nymphs like her rarely left their forest. They had to stay and guard their trees. Alongside the article there was a drawing of Zeus, the Mount Olympus Academy principal, standing next to the beaming couple who were soon to be married. Unfortunately, the bride-to-be wasn’t pictured wearing her wedding chiton. Understandable, though. It was considered bad luck to reveal the gown to everyone before the wedding day. Still, Echo had an interest in fashion and would have loved seeing it. She noted other details in the drawing. A goat stood beside Zeus, and a honeybee was buzzing around the principal’s head. Huh? What was that about? But then, as she unrolled more of the ’zine, her attention was caught by a smaller article that featured a drawing of three MOA students. Apparently they had located something called an herb of invisibility and had won a battle against some giants at the Parthenon. Wow, talk about exciting! At the left of this drawing was a turquoise-haired mergirl named Amphitrite. The article said she was a Nereid, a sea nymph. There were many kinds of nymphs. And like Echo, most were halfway between mortal and immortal, with limited magical powers. Echo recognized the girl at the center of the picture right off as the famous goddessgirl of wisdom and inventions, Athena. And the third girl in the drawing was Persephone, the goddessgirl of growing things. Echo gazed fixedly at the chiton Persephone wore. It had a double skirt, and there was a leafy border along its topmost hem. Basically it was the cutest, evergreenest outfit ever! In the forest, calling something “evergreen” was an even higher compliment than saying it was mega-cool. Carefully Echo tore out the drawing of the three girls and tacked it to her bulletin board, alongside oodles of other drawings she’d collected for fashion ideas. She had already copied almost all these ideas when sewing her own clothing. Hmm. There was still a half hour before school. Was that long enough to copy Persephone’s design? Yes! If she used the plain green chiton she had planned to wear and simply made a few additions. Full of enthusiasm for her new project, she grabbed her sewing box, which contained various decorative materials she’d gathered from the surrounding forest and mountains. First she took out a needle made from a piece of shell and threaded it with a long, thin strip of grass fiber. Then she chose some green laurel leaves and pink anemone flowers from her box and sewed them onto the hem of her chiton, making a border just like Persephone’s. All too soon Echo heard other nymphs vining down from their trees to land on the forest floor nearby. Oops! The half hour had passed without her noticing. Wasn’t that always the way when you were doing something you loved? Murmurs filled the forest as each of the nymphs called out a protective chant to the tree that she lived in and guarded. They renewed these magical chants every morning to keep their trees safe from all possible harm. Quickly Echo pulled the embellished chiton over her head and twirled in it, feeling like a million stars. Then she styled her hair the way Persephone had done in the picture, tucking leaves and flowers into it here and there. And lastly, she slipped on a pair of strappy sandals, which she’d made out of vines and dyed purple with crushed mulberries a few months earlier. Ta-da! Perfect! Hearing Daphne, her BFF, Echo peeked down through the branches of her tree. Her friend was with a group of nymphs that included Syrinx, a foreign exchange student visiting their school. Unlike the nymphs in this forest, Syrinx was a Naiad—a nymph that dwelled in a freshwater river. This was something Daphne would already know, however. She had once been a Naiad too, before she’d changed herself into a forest Dryad. But Syrinx liked to be a know-it-all. “I’ve got dozens of chants. Listen to this one,” Syrinx went on. “Protect this river every day. “Protect this fir tree every day. “Ready, Echo?” Daphne called up to her from the group of nymphs below. The two of them usually walked to school together. Lately they’d had to include Syrinx, though. “Coming!” Echo called down. She didn’t want to be late. “Guess I’d better make like a tree and leave!” she told FirHeart in farewell. It was their own private joke. Naturally her tree didn’t reply. Trees couldn’t talk till they were hundreds or thousands of years old, like the ones who taught at Nature School. Echo stepped into her pulley-and-vine ladder system. All the tree nymphs had them, with hollow-gourd pulleys, and vines strung and looped in a way that balanced a nymph’s weight and allowed her to quickly raise herself up or down, depending on which vine she tugged. Whoosh! She was on the forest floor in seconds. She hit the ground a little off balance, however. When she straightened, she came face-to-face with Syrinx. A little rattled, Echo grinned and nervously struck a pose. She raised one arm and lowered her other, copying Persephone’s pose on the cover of the ’zine, and hoping she’d look just as fabulous as that goddessgirl. Though she wasn’t sure why, she was eager for Syrinx’s approval. Maybe because this girl was Daphne’s childhood friend and Echo so wanted to be deemed worthy of being Daphne’s BFF. However, instead of admiring Echo, Syrinx giggled and smirked. Then she elbowed one of the other nymphs in the group. “Told you,” she said in a loud whisper. Several other nymphs nodded and giggled too. “Told you what?” asked Echo, her pose slowly wilting. “Oh, nothing,” replied Syrinx. But from the way she and the other nymphs were acting, Echo knew that wasn’t true. She felt slighted and a little embarrassed, though she wasn’t at all sure what she’d done wrong. Argh! This nymph is a total leaf fungus! thought Echo. How mean! Luckily, Daphne came to the rescue. “Never mind that. C’mon, you guys,” she said brightly, nudging everyone down the path. Ever since Syrinx had come here, Daphne was always having to smooth things over between the river nymph and Echo, trying to help the two of them get along. 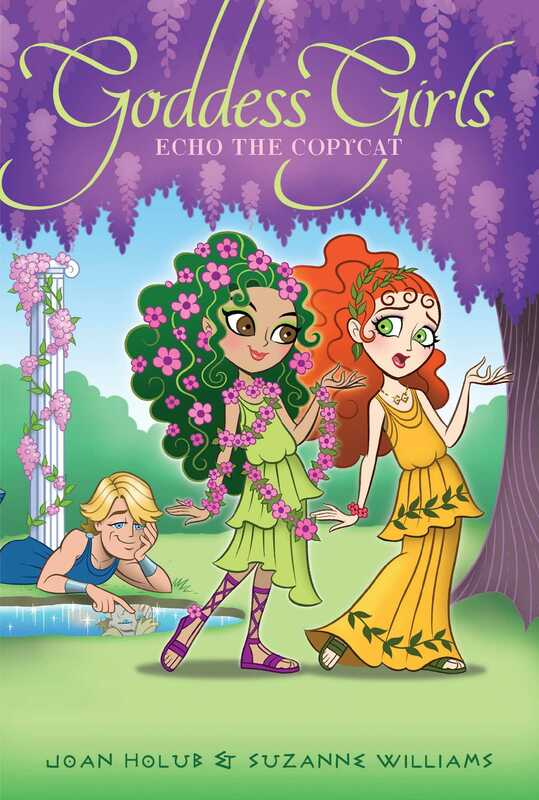 Now, as Daphne and the other nymphs moved off toward school, Syrinx and Echo were left eyeing each other warily. Syrinx slowly tucked a lock of her river-blue hair behind her ear. Without realizing what she was doing, Echo mirrored her action, tucking a tendril of her green hair behind her own ear. Echo’s face flushed. With a satisfied air Syrinx hurried ahead to catch up with the others. At the same time Daphne dropped back to be with Echo. “You okay?” she asked. A family of deer passed slowly in front of the two girls, causing a gap to form between them and the other nymphs as they all walked to school. “Spider girl, you mean?” The goddess Athena had turned Arachne into a spider when the girl had dared to challenge Athena’s weaving skills.